In the context of Buddhist values, the concept of wealth and the proper means for its generation and application has been addressed by Buddha ÅšÄ�kyamuni nearly 2500 years ago. 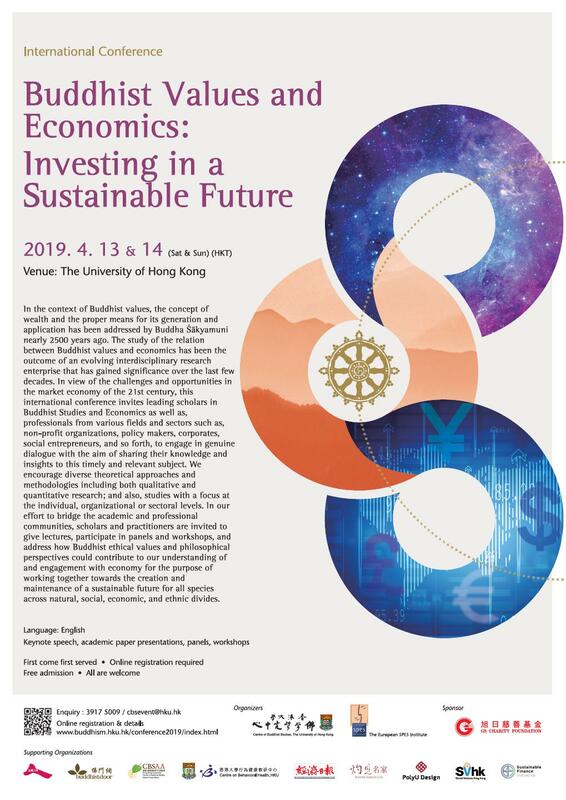 The study of the relation between Buddhist values and economics has been the outcome of an evolving interdisciplinary research enterprise that has gained significance over the last few decades. In view of the challenges and opportunities in the market economy of the 21st century, this international conference invites leading scholars in Buddhist Studies and Economics as well as, professionals from various fields and sectors such as, non-profit organizations, policy makers, corporates, social entrepreneurs, and so forth, to engage in genuine dialogue with the aim of sharing their knowledge and insights to this timely and relevant subject. We encourage diverse theoretical approaches and methodologies including both qualitative and quantitative research; and also, studies with a focus at the individual, organizational or sectoral levels. In our effort to bridge the academic and professional communities, scholars and practitioners are invited to give lectures, participate in panels and workshops, and address how Buddhist ethical values and philosophical perspectives could contribute to our understanding of and engagement with economy for the purpose of working together towards the creation and maintenance of a sustainable future for all species across natural, social, economic, and ethnic divides.